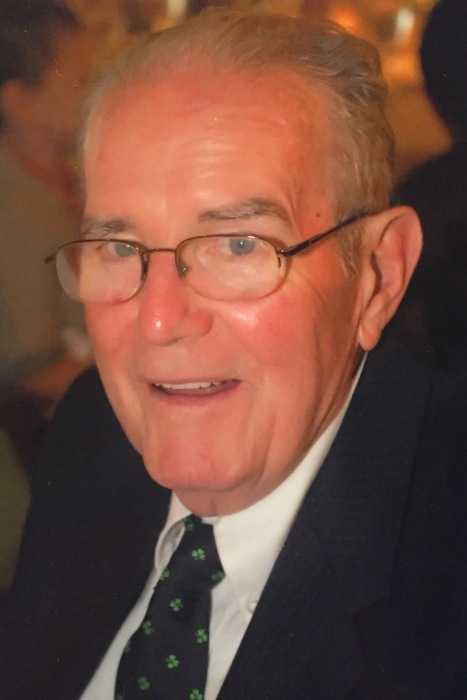 Lawrence “Larry” Joseph Montgomery Sr., 86, of Lebanon, devoted husband, father, grandfather, and great-grandfather, passed away on October 19, 2018 after a 10 year battle with Alzheimer’s disease. Larry was a first generation Irish American, born at home in New Haven, CT to Ellen “Nellie” McKenna Montgomery (Castlemaine, County Kerry) and Alexander Montgomery (Howth, County Dublin). He was one of seven children. Larry was in the U.S. Navy during the Korean War from 1950 to 1953, proudly serving on the U.S.S. Rodman (DD-456) and U.S.S. Sprig (AM-384). Larry Montgomery had well-worn hands. He was a self-made man who worked hard his whole life and instilled that work ethic in his children, Ellen, Amy, Lauren, and Lawrence. An unconventional learner, he completed his GED when he joined the Navy at 17 years old. After his military service, he worked as a tuck pointer and steeplejack in the Bricklayers & Allied Craftworkers Local 1 in Connecticut, later delivering milk for Schwink’s Dairy Meriden, CT and Brock Hall Dairy, Hamden, CT. He then joined the brotherhood of the Ironworkers Union, remaining a member of Ironworkers Local No. 15 of Hartford, CT for 46 years. Larry could fix anything and when he didn’t know how to fix something, he went to the public library to find the right “literature” to get the job done. He was proud of having built the family home in Wallingford, CT and a summer cottage at Amston Lake, CT. Larry was a lifelong Roman Catholic who served as an altar boy at St. Mary’s Catholic Church in New Haven, CT and later on parish committees at Our Lady of Fatima Parish in Yalesville, CT, bringing his expertise in building and construction. Larry co-fostered 12 infants through Catholic Family Services. He could be heard cheering through the house for the Red Sox, Ted Williams being his favorite player. Larry had a wonderful sense of humor and had the gift of gab that will be sorely missed by his loving wife of 64 years, Ethel Corcoran Montgomery. He is also survived by their four children: Ellen Abel (Victor Abel, Tracy, CA), Amy Nowlan (North Adams, MA), Lauren Montgomery-Rinehart (Niels Rinehart, Jericho, VT), Lawrence Montgomery Jr. (Lebanon, CT); two sisters, Ann Montgomery and Eileen Montgomery; as well as nine grandchildren, Jennifer Abel Pabst, Alexandra, Thomas, John, and Catherine Nowlan, Liam and Abraham Rinehart, Kiera and Logan Montgomery; two great-grandsons (Tanner and Tyler Arujo). Larry was predeceased by four brothers, Joseph, Jack, Alexander and Stephen and a granddaughter Emily Abel. There are no calling hours. In lieu of flowers, memorial donations in Larry’s name may be made to the Alzheimer’s Association, 225 North Michigan Ave, Floor 17, Chicago, IL 60601. A memorial service will be held on Friday October 26, 2018 at 11:00am at Church of the Holy Family, 185 Church St., Amston, CT. Burial with military honors will be held in the spring. For an online memorial guestbook please visit www.potterfuneralhome.com.